Four games, one confirmation (if needed): girls can do it, same as men or even better. Not just when kicking the ball in the pitch, as this was already and clearly indicated by many previous seasons and great players who were just waiting for the first "official time" to shine. Once said this, the "main point" and doubt for someone was: will six women referees be able to control the game in such important and somehow historical games? Well, you got the answer in 170 minutes plus six penalties: no troubles at all and general satisfaction. 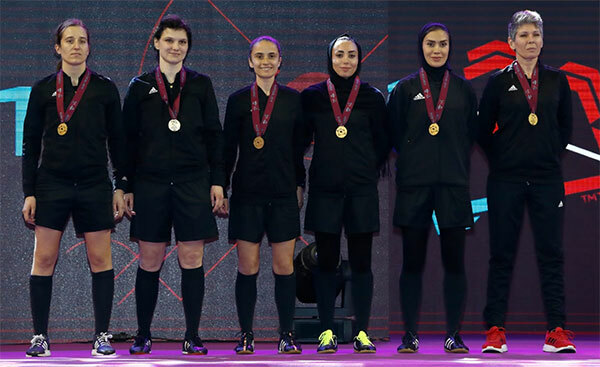 Irina Velikanova, Chiara Perona, Rachel Gonzalez Ruano, Gelareh Nazemi Deylami, Zari Fathi and Fatma Özlem Tursun completed the job in style, opening the doors for future competitions like this, as also recently done by CONMEBOL in the last South American women futsal challenges. Excellent performances from both European and Asian referees: a new era for refereeing.